In recent years, facial hair has made a great comeback in popularity. It seems you can't walk down the street, or into a bar or cafe, in any major American city and not see a plethora of young men sporting well-groomed, proud, and masculine mustaches, or more commonly, beards. This fashion development most certainly does throw razors and other shaving tools out the window. On the contrary, keeping such a handsome feature, well, handsome, requires attentive maintenance, and requires quality grooming tools. If you've ever suffered the annoyance of reddened, irritated skin, and the impression that a small rodent gnawed on your face in the wee hours of the morning, then it is high time to find the best solution. If you are not getting the desired results with safety razors or disposables then it may be time to consider an electric razor. Read on to find which are the best electric razors for sensitive skin! Why you should consider an electric razor? You have your choice of options, from Sweeney Todd style straight-edge razors, to old-fashioned single blade safety razors, up to the more recent, poly-blade variants. Then there are the electrics, the supposed bane of sensitive-skinned groomers everywhere. While many men have turned back the clock to older modes of keeping that face foliage at bay, the electric shaver continues to stand proud and proven as a valid alternative to its lower tech sisters. It's common to hear aficionados of the old-fashioned talk down the electric shaver, as being more irritating and less efficient than a manual blade. 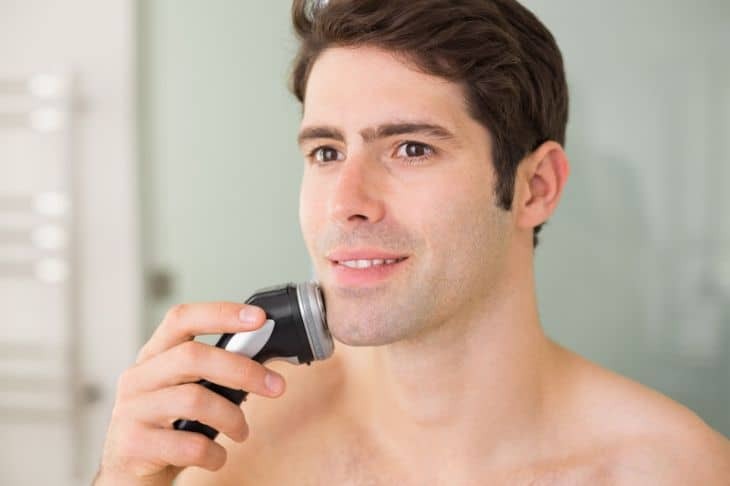 While there are some cheap electrics on the market, improvements in technology of the past couple decades have made good quality electric shavers, a worthwhile investment in your grooming. For this you should know how to get the best out of a shaver, the device should be comfortable against your skin, be durable, and it should provide overall high value for its price. You may notice that these conditions aren't much different than any manual razor! And yes, even guys with sensitive skin, can get a smooth-as-silk shave using an electric shaver. This is a great option that really drives home the convenience factor of electric shavers. Braun is one of the undisputed leaders in the world of grooming gadgets. The German brand make some of the most innovative sophisticated products that stands out from the rest. Braun Series 9-9095 cc is an award winning shaver that features the SyncroSonic technology. The SyncroSonic shaver head has 40,000 cross-cutting actions per minute for maximum efficiency and skin comfort. It delivers one of the closest shave possible making it one of the best electric shaver for sensitive skin. The shaver head comprises of 4 independent flexible cutting elements mounted on a fully pivoting head. This allows maximum contact with your skin and the shaver comfortably glides over the contours of the chin, face, and neck quite neatly. The intelligent sonic technology helps the shaver capture more hair with its 10,000 micro vibrations per minute and adapts power based on beard density. There are 2 titanium coated trimmer heads positioned in between the Optifoil heads. The Hyper Lift and Cut trimmer is designed to lift and cut flat lying hairs on your face. The Direct and Cut trimmer aligns and cut the hair growing in different directions. When you order it, you're also getting the charging/cleaning station, which automatically charges, cleans, dries, and lubricates the blades for each use. That’s the kind of thing I meant when I said the technology on these things has advanced impressively. See this video to see how the Braun Series 9 works. The shaver is IPX7 certified and can be immersed in water to a depth of 5 meters making it convenient to use in shower or rinse with water for easy cleaning. The rechargeable Li-ion battery gives a shave for 50 minutes and can be fully charged in just one hour. Also a quick recharge feature that charges the shaver for one shave in 5 minutes. A multi head lock mechanism lets you lock the flexible shaver head in 5 positions for a precise shave in hard to reach areas like under the jawline. It even has a popup trimmer for shaping your sideburns. There is an LED display to know the battery status, hygiene and travel lock status. Braun recommends changing the shaver head cassette every 18 months for best results. The clean and recharge refill cartridge also needs to be changed every 3 months. The Braun 9-9095cc gets especially close for an electric, and it holds together well. The price definitely raises your eyebrows, and maintenance can be also an expensive affair. But if you are looking for the best razor for sensitive skin, then this is the one to go for! 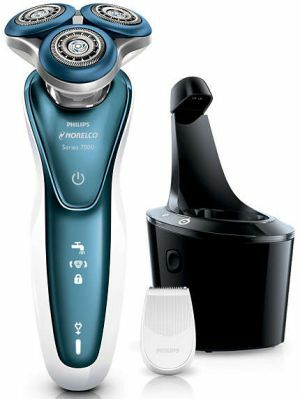 The Norelco 7500 from Philips is another best electric shaver that has been specifically designed for sensitive skin. Its shaving head configuration is different from the first three, being as it is a rotary, as opposed to foil shavers reviewed before. Philips is well known for its unique rotary head shavers that is a big departure from traditional foil shavers. The shaver head system consists of 3 rotary blades with Dynamic Flex Technology that moves easily in five directions as you move it across your face for a closer shave. The Gentle Precision Blade system guides the hair to optimal cutting position and cuts long, short and flat lying hair smoothly without irritating your skin. The simultaneous even action of 3 pivoting rotary blades also reduces stress on skin and inflammation when shaving. 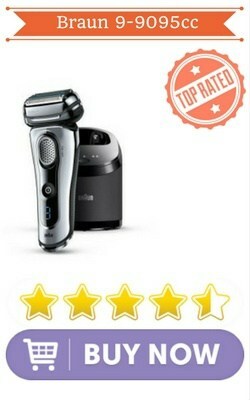 It supports 2 speed settings and delivers 151,000 cuts per minute for the smoothest shave. The 7500 also gets a unique comfort rings with anti-friction microbead coating that reduces friction to glide the shaver effortlessly over your skin. This reduces irritation and makes it one of the best electric shaver for sensitive skin. See the Philips norelco in action below. A smart clean system charges, lubricates and cleans the shaver with an alcohol-free formula using dual filtration system. With an hours charge you will get 50 minutes of shaving time and a quick recharge for 5 minutes packs enough power for a single shave. Aquatec technology makes the shaver waterproof and lets you enjoy a wet shave with a foam or gel. An intuitive LED display show battery status, header replacement indication, travel lock and hygiene status. It also has a smart click on precision trimmer for sideburns and even comes with a deluxe travel pouch. This can help with getting the kind of precision you want, whether you're going clean-shaven or keeping a beard. Even better, it is, cheaper than the first three shavers on the list, while still delivering a close and soothing shave even on guys with sensitive skin. Five blades are better than four, as far as a closer shave and its more good news for those with sensitive skin. The Arc5 ES-LV95-S from Panasonic has 5 blade cutting system powered by a 14000 cycles per minute linear motor drive. The Lift tech foil lifts flat lying hairs, the comb blade cuts the hair growing in different directions and the finishing coil ensures a smooth even shave. It has an Active shaving sensor that automatically senses your beard thickness and adjusts the cutting power to reduce the stress on your skin. To enable the closest shave it also come with a flexible pivoting head that can swivel up to 45 degrees to glide smoothly over your neck and jaw areas. The Arc 5 can also do a great job on all the contours of your face, and works just as well in the shower or completely dry, depending on your fancy. A built-in pop up trimmer is also there to work on your sideburns. The cordless shaver is completely waterproof so that you can use in shower with gel or foam for maximum comfort. The rechargeable battery gives 45 minutes of shave with one hour of charging and 5 minute quick recharge gives enough power for a single shave. You also get to know the battery status, charging status and cleaning reminder through an LCD display on the shaver. Like the Braun, its charging station doubles as a cleaning station, that cleans, dries and sterilizes the system in 90 minutes. A sonic vibration cleaning mode enables you to clean it under running water or you can use the cleaning station. It comes with a travel pouch and a travel lock button holds the head in place. Overall this is a premium offering from Panasonic that gives a smooth and gentle shave for those with sensitive skin. The shaving head is not as compact as the Braun and can be difficult to maneuver to get a close shave. Another step in price up from the Arc5, but also another high value option from Braun. For those who want to experience Baun’s intelligent sonic technology at a lesser price can consider the Braun Series 7. It is a proven, popular product from Braun that has a triple action cutting system with two Optifoils and an Active Lift trimmer. The Braun 7 has an advanced led display that indicates charging status, battery level and foil replacement. In addition to having the high tech charging station, blade technology, the Series 7 can adjust between one of five different shaving modes, the lower settings being best for sensitive skin, to avoid irritation. It includes a precision trimmer for getting those stache and sideburn lines sharp, and can also be used in water without safety or performance issues. One thing I liked is that it charges lightning quick: five minutes of charging brings the battery from 0% up to enough for a full shave, and an hour's charge gives about 50 minutes of shaving time; enough for several sessions. All-in-all, another great offering from Braun for guys with or without sensitive skin to get a close and convenient shave at a good value. The Braun Cooltec shaver has an integrated thermo electric ceramic cooling element (TEC) between the shaving foils that actually keeps your skin cooler, reducing irritation as the shaver does its job. The Active cooling can be controlled with a single button. It may sound a bit gimmicky, but it does work well, and has been clinically proved to reduce skin redness, burning and itching sensations. The adaptable 3 stage cutting system that consists of a trimmer with integrated TEC elementand 2 sensofoils can move independently to follow your facial contour. The specially designed sensofoils offer even more gentleness and comfort for those with sensitive skin.Note that it may take a little getting used to if your experience has been with more flexible, pivoting electric shaver heads, but you can get used to it; may just require a bit more care. The cordless shaver is 100% waterproof and a rubberized grip make it easy to use in shower. You can get 45 minutes of shave time with a 1 hour charge. It also have 5 minute quick recharge feature , precision trimmer and an LED display for battery status, cleaning and travel lock indication. It also comes with a cleaning/charging station. The CoolTec is another good option, offering that extra cooling feature to address the sensitive skin. If you've found that cold water is especially helpful to you in reducing irritation, you'll likely get extra utility out of this one compared to the others on the list. If you are new to an electric razor you may want to understand the important features to look for and other factors that can help you decide which razor to buy. For those just starting out it can be confusing whether to get a foil shaver or a rotary one. Both use slightly different methods to cut the hair and both give similar results. Foil Shavers– These shavers have the blades housed inside a thin perforated metal foil to protect your skin. The curved foil mesh captures the hair and directs them to the moving blades inside for a clean shave. Foil shavers can capture hair more effectively with its slots and gentle on sensitive skin. Foil shavers are better if you have fine hair and shave daily. They also give more accurate finish for your sideburns or if you want to shave your head. Rotary Shavers- They have blades placed under grooved slots on a circular rotating shaver head. As you move it across your face, the shaver head captures and cuts hair with the rotating blades below. They usually have 3 equally spaced circular heads for easy maneuvering over uneven areas like neck and chin. Rotary shavers are good when you have thick or long hair and you don’t shave daily. Foils shavers are generally considered to better for sensitive skin but now you can get rotary ones with soft beadings that reduce irritation. The cordless shavers are in vogue due to the fact they are easy to use and are usually waterproof too to be used in shower. The cordless one can come with normal batteries or rechargeable batteries. Rechargeable ones give better performance and power and you can consider battery powered ones if you are a frequent traveler. Plugin models will be less expensive and you can save time by saving time for recharging or replacing the batteries. A 100 % waterproof shaver is nice to have so that you don’t have to worry about accidentally splashing it with water or dropping it in your tub. Wet shaving with an electric razor always seems to reduce burns, bumps, and ingrown hairs and is a key feature to look for. This is a new feature that is found only in electric razors where you get a cleaning/recharging unit that cleans, lubricates, dries and recharge your shaver all at the same time! They usually have an alcohol based cleaning formula to remove stubble and germs and also improve blade efficiency with a lubricant. One thing to not though is that you may have to spent time and money to replace these cleaning cartridges every 3 to 4 months. Other things to consider are the cost and availability of replacement cartridges. The razor head will need replacement once every 18-20 months depending on your use. So look for models that are in demand and have a good supply of refills. LED display which shows charging indicator, battery status, head replacement notification, travel lock and hygiene status, is a cool feature and gives a premium feel to your shaver. Also look for ergonomic designs that are easy to hold and use. 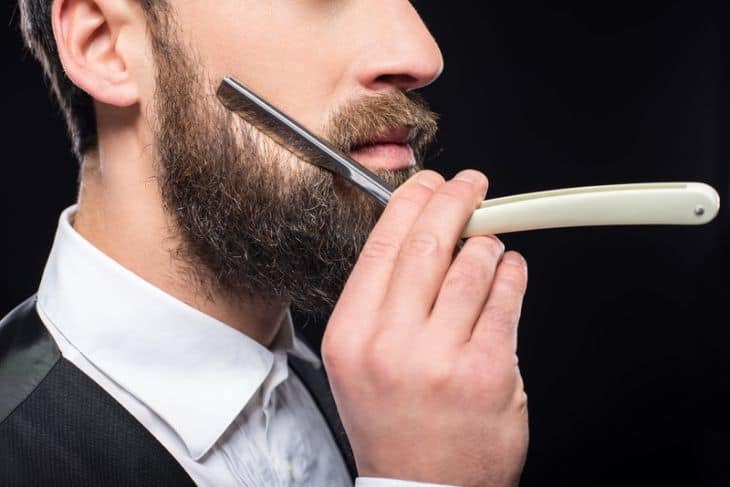 You can even get smart shavers that can connect to your smartphone via bluetooth to get customized shaving tips and even change sensitive shave settings!​ Most of top end shavers have a pop up trimmer to shape your mustache or sideburns. There you go. Besides looking like something out of Star Trek, these modern, high quality electric shavers can all get the job done and help you look fresh without the irritation you could find on some lower end products. The Braun Series 9 9055cc though expensive is our top choice for the best electric razor for sensitive skin. Remember to (Safely! Confirm that it's waterproof!) shave in the shower, or at least with moistened skin, to reduce irritation, even with the glide-features and multiple blades. Technique, combined with a quality tool, is what gets the best results. What Is The Best Shaving Soap For Sensitive Skin In January 2019? “TheHomeGear” aims to be a one-stop source for the latest lifestyle products for your home. Our mission is to enable our readers lead a better life by making smarter choices with the help of in-depth reviews presented in a simple and transparent way. TheHomeGear is a participant in the Amazon Services LLC Associates Program, an affiliate advertising program designed to provide a means for us to earn fees by linking to Amazon.com and affiliated sites. © Copyright 2019 By TheHomeGear, All Rights Reserved.